GRECIA is a nation led by MINISTER Master Antony on the continent of Europe. GRECIA's government is a Republic with very moderate social policies. Economically, GRECIA favors moderate policies. The official currency of GRECIA is the Euro. At 422 days old, GRECIA is an ancient nation. 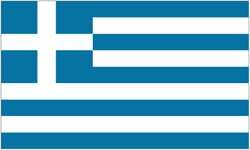 GRECIA has a population of 5,290,933 and a land area of 72,000.00 sq. miles. This gives it a national average population density of 73.49. Pollution in the nation is almost non-existent. The citizens' faith in the government is at an all-time high with an approval rating of 100%.